I love terrariums! They’re the ideal blend of art and craft, gardening and decor – and you can create it to suit your own personal interest in gardening, whether you want to tend it or just admire it! (It all depends on what you put in it.) 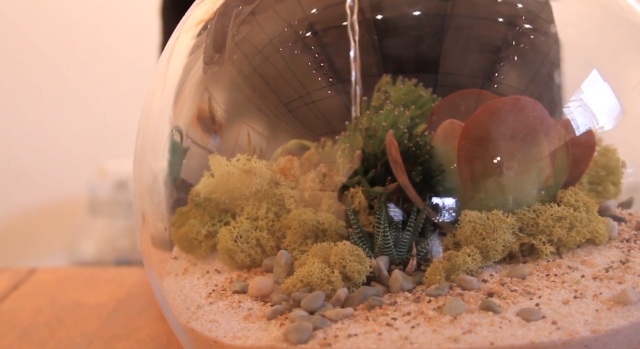 A terrarium can express you at your most idiosyncratic, or simply provide your weary eyes with a peaceful place to rest. If you haven’t made a terrarium before, you’ll find this video disarmingly easy to follow, and truly encouraging. If you’re a seasoned terrarium-crafter, you’ll love watching Amy Bryant-Aiello of Artemisia’s special style as she builds a beautiful dryland terrarium from scratch. View the video here. And give it a try!